The Model 9210 is a compact multichannel lock-in amplifier which uses the latest FPGA technology to deliver an instrument which can make complex AC and DC measurements on up to ten different analog signals. In addition it can generate excitation signals to drive the experiment, as well as measure the current delivered by these signals. It is therefore ideally suited to making direct impedance measurements on samples such as superconductors or in material analysis, as well as for use in optical, calorimetric, AC susceptibility, and many other experiments. The unit is operated via a Gigabit Ethernet or USB interface from a free Windows compatible software package, or via a LabVIEW 2016 driver. Both packages allow full instrument setup and display of measured results in a wide range of digital and graphical formats. This powerful instrument, in a slimline console which can stand on the benchtop or be rack mounted, makes the 9210 a valuable addition to any laboratory as well as a cost effective alternative to purchasing multiple instruments. The Model 9210 can be ordered with between one and five dual channel signal processing modules. Each module includes a 20-bit DDS signal generator with 1MSa/s update rate which is capable of outputting a sine, sawtooth, triangle, square, or noise waveform with or without a DC offset. The output frequency is selected from one of six programmable values or from one of two phase locked loops which will lock to external TTL logic signals, and the output amplitude is adjustable within three full scale ranges of ±10 V, ±1 V and ±0.1 V. The generator output can be taken directly as a single-ended voltage signal or as a floating signal with integrated output current measurement. The signal generator output is coupled to the experiment. For example, in the case of a sample resistance measurement, it would be wired in series with the sample, while the voltage generated across it will then be connected to the model 9210’s signal inputs. Each signal processing module includes two analog differential voltage input channels with twelve adjustable gain stages ranging from x1 to x5000, giving a full scale sensitivity range (pk-pk) of ±10 V to ±2 mV with a noise floor down to 1.8 nV/√Hz . Signals are then passed through anti-aliasing low pass filters before being sampled at 1 MSa/s by two 18-bit precision ADCs. A further ADC samples the signal representing the current being delivered by the generator. 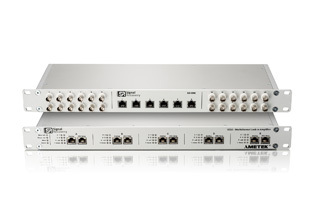 Two dual phase lock-ins per input channel, and two per signal generator output, operating at internal or external reference frequency or harmonic. The BB-BNC breakout box, which is also available, makes connecting conventional BNC terminated signal cables to the RJ45 connectors a great deal easier. The 24 BNC jacks on the front panel are internally connected to flying leads which can be plugged onto pin headers which terminate the connections from the six RJ45 front panel sockets. These are in turn then cabled to the sockets on the front panel of the 9210 with Cat7 patch cords. The box also includes screw terminal connections to each of the RJ45 connector pins which can be used for direct connection to cables from the experiment. The 9210 is operated from a Windows compatible program that is supplied with each unit, or via a LabVIEW2016 driver. Both options allow all instrument settings to be adjusted and output readings to be collected and displayed in graphical and numerical format. Useful additional features include oscilloscope and FFT displays, as well as information screens showing the pinouts of the input connectors and clear system block diagrams. A panel in the software gives quick access to the controls and digital displays corresponding to one selected channel, making it even simpler to use. The Ethernet connection to the model 9210 can be made either directly to the controlling computer or via a router.